Recently the Foreign Investment Review Board released its 2016-17 annual report. Foreign investment in agriculture jumped 52% from $4.6 billion the previous year to $7 billion. China moved to the top of the investment list with $2.2 billion of the total amount. Canada moved to second place with $1.5 billion, followed by the US with $900 million. The UK, traditionally one of the biggest investors in Australia, dropped to eighth spot with $182 million. As big as these figures seem, agriculture only accounted for 4% of the $192 billion investment across Australia. China’s rise to the top was helped by some big buys including the $386 million sale of the Kidman and Co cattle empire to Gina Rinehart and Shanghai CRED, and Chinese dairy Inner Mongolia Fuyuan Farming Company’s $300 million investment in Burra Foods. Canada’s rise to second place is due to a massive increase in investment by Canadian pension funds over their investment of $240 million in 2015-16. Other investors including companies based in Singapore and China have increased their investments in Australian agriculture with purchases of Australian land and agribusiness companies. For example, recently Chinese company Dongfan Modern Agriculture Holding Group paid $18 million for a 70% stake in Sydney company Bio Health Pharmaceuticals. Dongfan has access to a $50 million loan to allow it to acquire other suitable Australian businesses. Singapore company Milltrust Agricultural Investments is planning to build on its extensive agricultural investments in Australia possibly by launching a $200 million listed property trust. This will involve buying land from farmers then leasing it back to them. Some pretty big Australians are emerging as major players when it comes to investing in Australian agriculture. 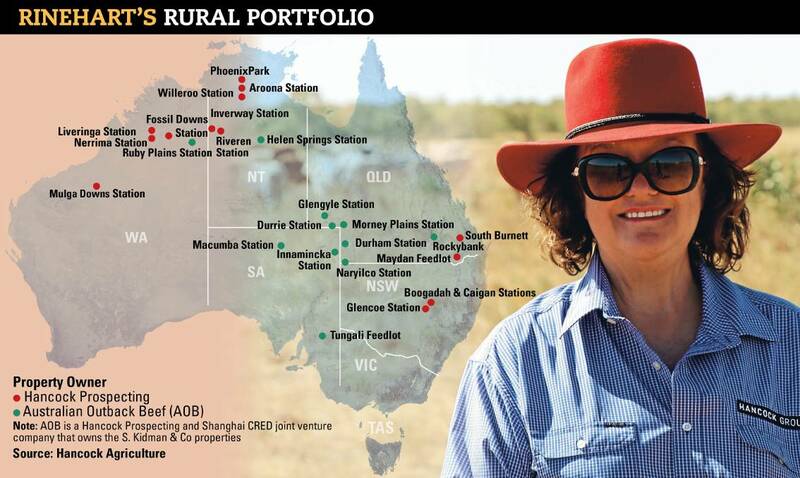 Gina Rinehart has a portfolio of properties totalling over 2.2 million hectares, not including her joint purchase of Kidman and Co. She has been on a buying spree snapping up grazing properties in Queensland and the Northern Territory. Andrew Forrest has about 1.28 million hectares of beef properties in Western Australia. He also paid $40 million for Harvey Beef, WA’s largest beef producer in 2014. Recently there has been a flurry of multi-million dollar sales and purchase of Australian agricultural companies to firms based in the UK, US, Holland and Hong Kong as well as Chinese investors. The biggest 170 corporations and individuals own more than 900 properties across Australia. They are favouring irrigated properties, citrus and almond crops in addition to grazing properties. Australia’s small and medium farmers are faced with either trying to get bigger or get out of farming. Their only hope is against the foreign take-over of Australian agriculture is to unite with their natural allies—the Australian working class.